In just a week from now, the curtains will close for the last time on the stage of the Ford Foundation’s International Fellowships Program (IFP), an ambitious effort to use higher education to promote social change. Under the IFP, agents for social change from a variety of disadvantaged backgrounds from 22 countries were provided scholarships for postgraduate education to some of the best universities in the world. The goal? – to equip them with the confidence, perspective, and tools to enable them to return to their communities and play a much more impactful role in their transformation. India was a major participant in, and beneficiary of, the IFP. 330 outstanding individuals from India were granted the Fellowship since its inception in 2000. They come from parts of the country with the greatest challenges, and most of them faced multiple dimensions of disadvantage arising from caste, religion, gender, economic deprivation and physical disability. I had the good fortune to experience at close quarters the potential benefits of a programme like the IFP. In mid-2009, the director of IIM Bangalore asked me to set up a structured mechanism to support the students admitted under India’s Persons with Disabilities Act. I started off by looking at what other leading institutions in India had done in this respect, and visited the Jawaharlal Nehru University in Delhi which had what was believed to be the most comprehensive infrastructure for disability support. But we figured out the most appropriate way of creating better access for students with disability only after I met Meenu Bhambhani at a meeting of the CII Karnataka Disability Forum. In just a few minutes of discussion with Meenu, I found that she had in her head the entire blueprint for the creation of an Office of Disability Services (ODS). She saw the ODS as the nucleus for providing students with disabilities an educational and life experience on par with what other students received. Not only was Meenu keen to share this with us, she went one step further offering to provide seed support from her company to help us set up an ODS at IIMB. Over the next few years, Meenu was our mentor for the ODS as she goaded, coaxed and prodded us to set it up to the highest standards. 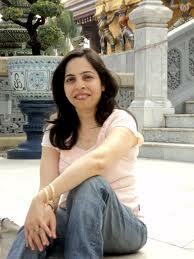 Meenu is one of the 330 Indian IFP Fellows. As part of the IFP, she did a Masters in Disability Studies at the University of Illinois, and that’s where she not only learnt about how an ODS works, but also saw one working at first hand. Before IFP, Meenu was an Assistant Commissioner for Disabilities in her home state of Rajasthan where she struggled to overcome bureaucratic constraints to make an impact. Today, she is the head of CSR for a prominent IT company, and she has spearheaded the creation of a disability-friendly workplace in her company resulting in it becoming one of the biggest employers of persons with disability in India. She has taken up the challenge of making India’s elite institutions of higher education disability-friendly, and after working with us at IIMB has shifted her attention to other highly ranked institutions. If Meenu’s experience is anything to go by, programmes like the IFP have tremendous potential to be successful as catalysts of social change. But that didn’t happen by chance. A four stage rigorous yet empathetic selection process to select the most appropriate candidates for the Fellowship. I was impressed by the efforts they took to spread information about the fellowships across the states they targeted. And, to uncover the potential of individual candidates. They realized, for example, that for people who grew up amidst considerable hardship, prior academic performance may not be a good indicator of scholastic aptitude and ability to cope with a challenging academic programme. Careful matching of Fellows to academic programmes and institutions. The IFP office in India worked one-on-one with each selected Fellow to identify the courses that would best suit their interests and domains of activity. They then worked with each Fellow on the entire application process. Elaborate preparatory coaching and study. Each Fellow spent several months on filling gaps in their knowledge of English and academic subjects prior to leaving to the University where they had been admitted. Fellows were also coached on how to adjust to a different culture, and about social etiquette in that country. All these efforts were very important because the Fellows had been out in the field for a long time after their initial degrees and were therefore not immediately ready to step into a graduate classroom in the US or UK. Close mentoring and continuous support. Not surprisingly, in spite of the careful preparation, many of the Fellows experienced serious challenges when they entered academic campuses in the developed world, as the expectations and experience were quite unlike anything they had seen before. Many of them also had to cope with personal challenges such as deaths of close relatives while they were pursuing the Fellowship. The IFP India office played an important role as loco parentis in helping the Fellows weather these challenges. Higher education can undoubtedly benefit individuals. It is a powerful vehicle for economic stability and social advancement. That’s the rationale behind the scholarship programme of the Foundation for Excellence, an organization that I have had the privilege to be associated with. FFE provides scholarships for undergraduate education in engineering and medicine to students with outstanding academic backgrounds but disadvantaged economic circumstances. We have seen how FFE’s scholarships can transform the lives of these students and their immediate families. But can higher education of an individual have a large societal impact? The designers of the IFP believe the answer is “Yes.” The short essays on individual Fellows in Opening Doors, and the survey conducted among the Fellows suggest that the opportunity to study in a high quality graduate programme outside India gave Fellows an opportunity to reflect on their lives and aspirations in a completely different setting. This allowed them to take a fresh perspective and re-calibrate their expectations of themselves. The experience not only sharpened their ability to think critically, but also gave them a new set of frameworks and tools that would enable them to enhance the scope of their impact. More than anything else, it increased their confidence and motivation. While it’s still too early to do a detailed cost-benefit analysis of the IFP, if Meenu’s experience is anything to go by, it has changed the canvas on which Fellows can paint and the arena in which they can play. I, for one, will be watching with considerable anticipation, how the IFP India Fellows evolve. But, to end on another more sobering note, I really wonder – when will educational institutions in India be able to provide an educational experience similar to what the IFP Fellows received in the US and the UK? Will that happen in our lifetimes?